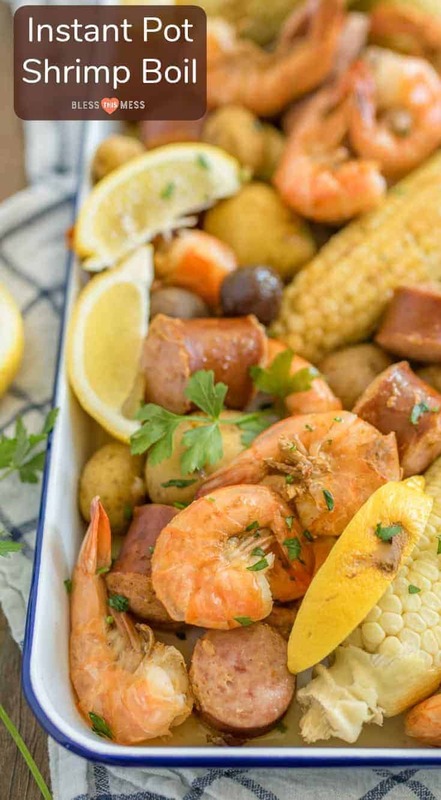 Quick and easy Instant Pot Shrimp Boil made with potatoes, corn, shrimp, sausage, and just a few simple seasonings. 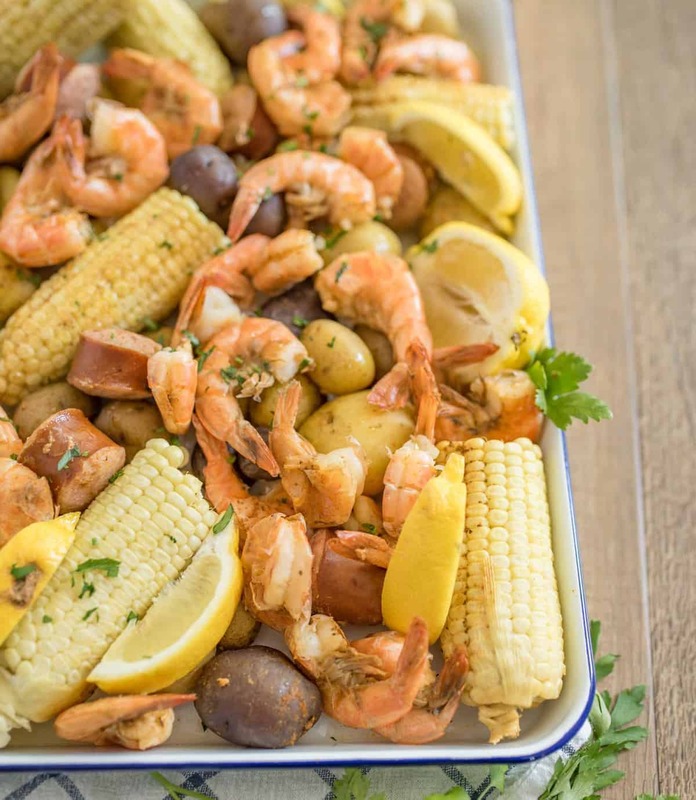 Have you ever had Shrimp Boil? 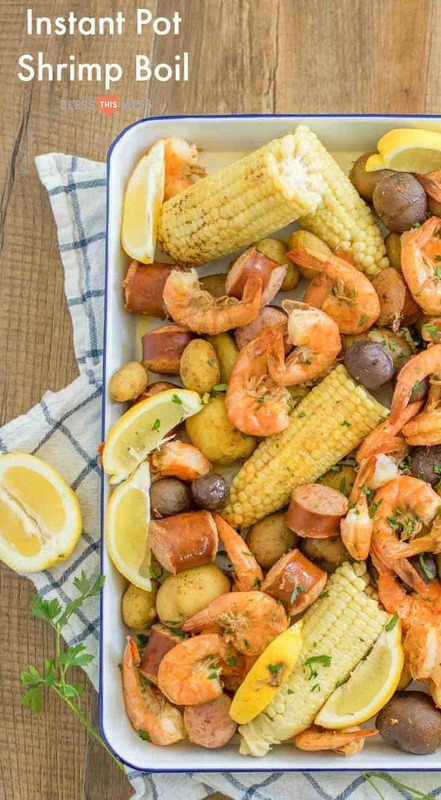 Sometimes it’s also called Low Country Boil or Cajun Shrimp Boil, too. I love it! I grew up going to the beach in Gulf Shores, Alabama and this was a favorite meal to eat along the coast. Now anytime we leave the desert in search of some ocean waves, I make a point to find a good shrimp boil place. 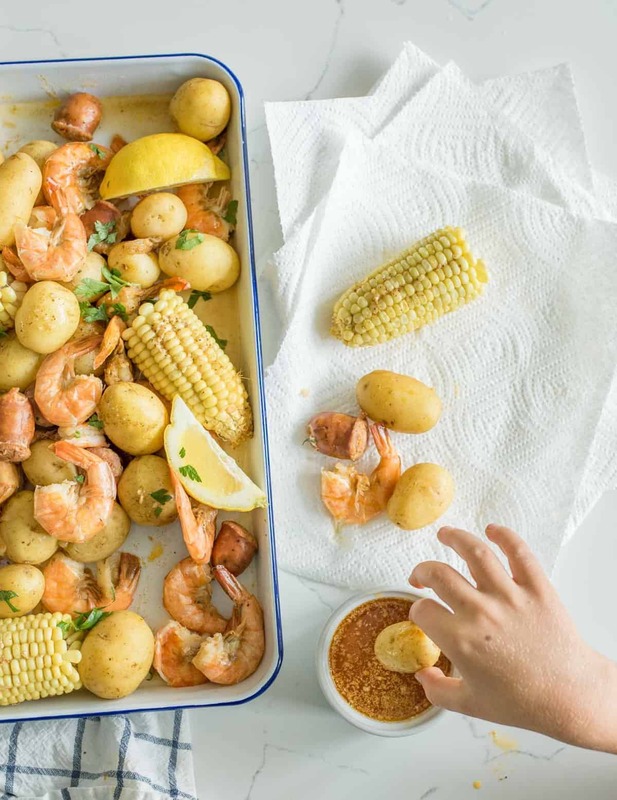 I introduced my kids to the wonder that is shrimp boil this summer and they begged me to recreate it at home for them. I obliged! 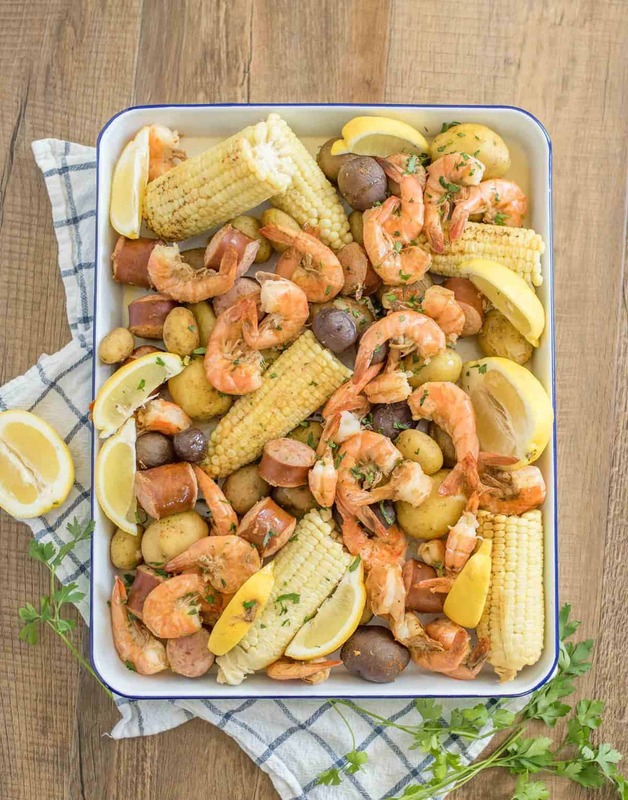 Shrimp boil is fun because it’s all spread out on the table or in a big tray and you just pick and eat what you want. You can dip it in delicious butter, add a little hot sauce, give it a squeeze of lemon. It’s just a whole lot of fun eating communally with your fingers. It doesn’t hurt that there’s plenty of shrimp and potatoes involved, too (favorites of my kids). 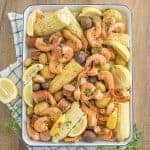 I loved using my Instant Pot to make shrimp boil because it really helps to infuse the potatoes with lots of flavor, plus, it’s fast and really hands off. The perk of using the Instant Pot is that it’s a set-it-and-forget-it kind of appliance. So now when you are craving a trip to the beach, but are stuck at home, you can have a delicious fun meal to remind you of the sand and surf. I have also added 1 pound of crab legs to the last cooking time (when you add the shrimp) and it was delicious. I found the super small “baby potatoes” packaged together in a bag near the other potatoes in a well-stocked grocery store. You can use any of the varieties of potatoes they might have or that you like. They should be about 1 to 2 inches across. Feel free to serve this with hot sauce on the side or add some while cooking if you like a little heat. This recipe will fit in a 6 quart or 8 quart Instant Pot. I have the 8 quart and love it for my big family. This is a very casual meal – serve with lots of paper towels and enjoy around the table together. Place potatoes and onion in the bowl of your instant pot. Pour the broth over the potatoes and then sprinkle 1 tablespoon of Old Bay Seasoning over the potatoes. Add two bay leaves to the top. Close the lid of your Instant Pot and set the pressure cook time to 4 minutes, valve set to “sealing.” Let the pot come to pressure and cook. Add the sausage to the pot, on top of the potatoes, and add the shrimp. Add the corn (husks removed, washed, and broken into halves) to the top. Close the lid of your Instant Pot and set the pressure cook time to 1 minute, valve set to “sealing.” Let the pot come to pressure and cook. While it is cooking, melt the butter in the microwave in a small bowl. When melted, stir in the remaining 1 teaspoon of Old Bay Seasoning. Slice the lemon in half and slice one half into wedges. Dump the contents of the instant pot onto a large rimmed baking sheet. Squeeze the lemon half over the Shrimp Boil in the tray. Serve off the tray right away with the seasoned butter for dipping, additional lemon wedges, and plenty of paper towels for messy fingers. I have also added 1 pound of crab legs to the last cooking time (when you add the shrimp), and it was delicious.